ARS Mayr Chapter in Fresno Turns 100! 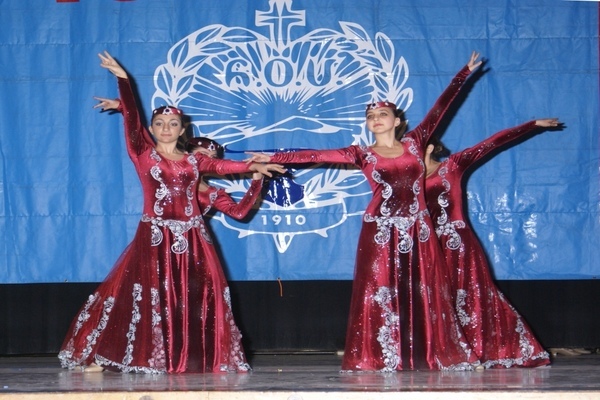 The ARS Mayr Chapter of Fresno will hold a 100th Anniversary Celebration Luncheon on Sunday, September 13, 2015, at 1 p.m., at Holy Trinity Armenian Apostolic Church Social Hall, 537 “M” Street, Fresno, Calif. 93721. Does your child or grandchild attend a non-Armenian school? Perhaps you want to enrich their cultural background with Armenian language and culture education in a fun and motivating environment. Enrollment has begun for our highly successful Saturday School program in the Western region. From the early days, the ARS established Saturday schools to pass on the Armenian language and culture to the new generation. Currently, there are 16 Saturday Schools in our region that enroll students ages 2.5 to 12 or 16, depending on the school. ARS Saturday School students have been grateful for the opportunity to learn to read and write the language of their forefathers, while some have gone on to serve on civic and community organization positions. For further information and to enroll your child, visit the following Link. Reopened on Saturday, August 29, 2015, 10:00 a.m. – 1:00 p.m.
Reopening on Monday, August 31, 2015, 1:00 – 4:00 p.m.
Reopening on Friday, September 11, 2015, 4:00 – 7:00 p.m.
Reopening on Friday, September 11, 2015, 5:00 p.m. – 7:30 p.m.
Reopening on Saturday, September 12, 2015, 9:30 a.m. – 12:30 p.m.
Reopening on Saturday, September 12, 2015, 9:30 a.m. – 1:00 p.m.
Reopening on Saturday, September 12, 2015, 10:00 a.m. – 1:00 p.m.
Reopening on Saturday, September 12, 2015, 10:00 a.m. – 12:00 p.m.
Reopening on Friday, September 18, 2015, 3:45 p.m. – 6:30 p.m.
Reopening on Saturday, September 26, 2015, 9:00 a.m. – 12:00 p.m.
Save the date for a captivating seminar on leadership, team building and conflict resolution, and public relations and communication. Saturday, January 23, 2016, from 9:30 a.m. to 3:00 p.m. at the Ronald Reagan Presidential Library, 40 Presidential Dr, Simi Valley, Calif. The ARS Anahid Chapter will hold a Party Night on Friday, September 11, 2015 at 7:30 p.m., at the Ferrahian High School courtyard, 5300 White Oak Ave., in Encino, Calif.
Entertainment will be provided. Please RSVP by calling (818) 705-1608 or (818) 609-8098.